I've been wanting to do this since reading Renegade's exploits with his hornet (here) but it took me quite a while to get ahold of one since I didn't want to buy the whole set. I bought this particular hornet from CrankyMonkey while at DCNO. Mainly I'm expanding where Renegade left off. I've shortened the body shell as much as possible and added 5-inch length PETG barrels. I've cut away a good deal of the inner bracing in order to move the stock pump as far forward as it will go while still working. 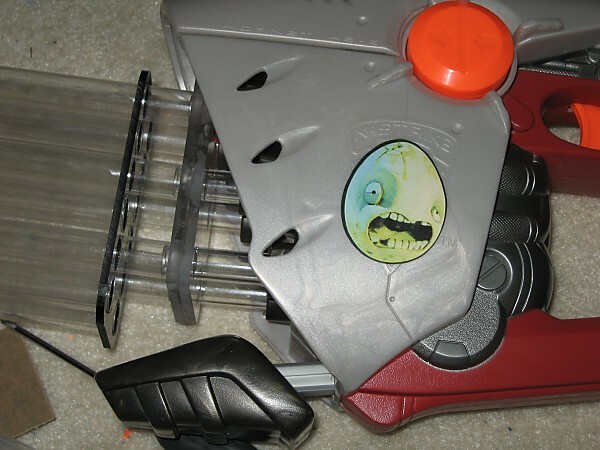 I also cut off the "Unity Power System" trigger and one-way valve stem. The inner diameter of the tube that leads to the extra 6-shot trigger valve was luckily the perfect size to be tapped to 1/4" NPT. So adding an instant tube fitting will be a cinch. I'm currently waiting on supplies but the plan is as follows. + The inlet that is replacing the Titan 6-shot trigger will allow me the option of hooking this gun up to the back-pack tank I made for use with my Magstrike 20. The tank output will be regulated down to 30psi. + The tank output will have a one-way valve. That way once the tank is empty I can still use the stock pump to prime the gun without having it attempt to fill the tank as well. + The tank input fitting can be optionally plugged if I want to use this gun as a standalone weapon to be primed with just the stock pump. The only hurdle so far as been that the tubing in the gun has metric dimensions. I'm waiting for the parts I need to come in the mail so I can complete this. Edited by CaptainSlug, 05 May 2007 - 05:21 PM. Very nice. I never liked the fake stock thing. I like how when you empty your backpack you can pump just the gun up. How many shots will you get off the tank? How many shots will you get off the tank? I have NO idea. 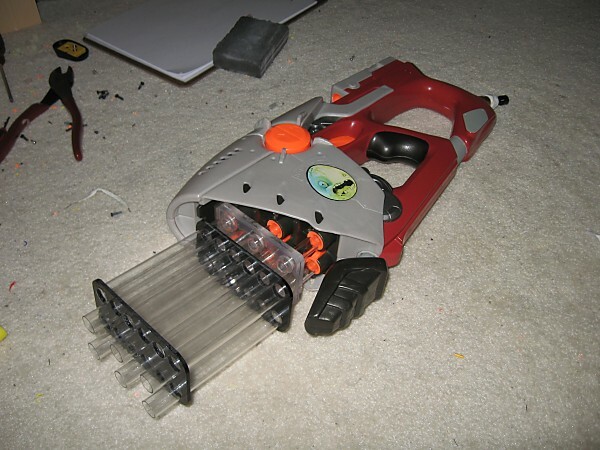 Filling the tank up to 65psi gave me 60 shots with the magstrike, but that gun is a model of pneumatic inefficiency. This gun should easily be able to give me more shots per tank fill. Edit: Just made and added a piece to reinforce the barrels. And I might add another to the tips of the barrels that I cut to include a forward sight post. Will have to get rubber grommets or c-molding for it. The internals of this gun are very strange but I have a 98% understanding of how it works thanks to a super powerful flashlight allowing me to peer inside of the blast chambers and various other parts without having to take them apart. Edited by CaptainSlug, 26 March 2007 - 04:38 PM. That's really neat. So, with this huge tank, will you be getting much better ranges than with the regular pump? Or does the tank just fill the smaller tanks, so you will be getting the same ranges? So 60 shots with the Magstrike should get you up around at least 70 with this? If so, that's insane. 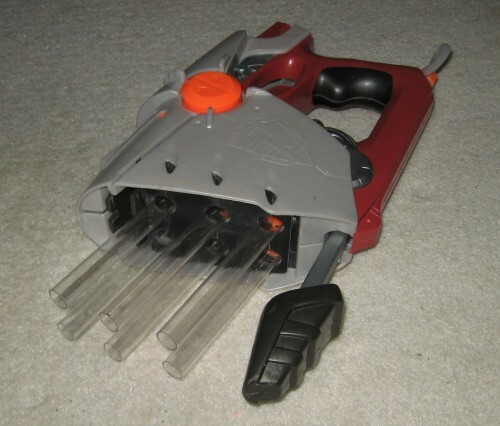 You should make a speedloader to further decrease reload time. Yes, one or both. The aim is to not need to do as much pumping in the middle of a firefight. I should be able to get atleast 80 shots out of a single tank fill. But we'll see. Edited by CaptainSlug, 27 March 2007 - 09:32 AM. Thanks for making this... You just gave me an idea. The first barrel is leaking for internal reasons I can't fix. So if anyone has a spare hornet I'm willing to buy it. 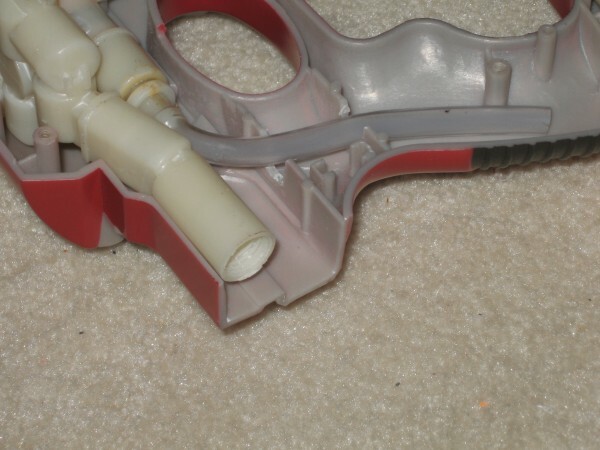 Basically there's a back-pressure valve in each blast chamber that is actuated by the trigger valve releasing the pressure on that barrel in sequence. If one back-pressure valve is stuck or the body leaks, you can't pump up any of the blast chambers. The black piece is acrylic. Edited by CaptainSlug, 27 March 2007 - 05:11 PM. Knowing how this gun works, and the fact that I have 4 working barrels leftover, has allowed me to realize something. 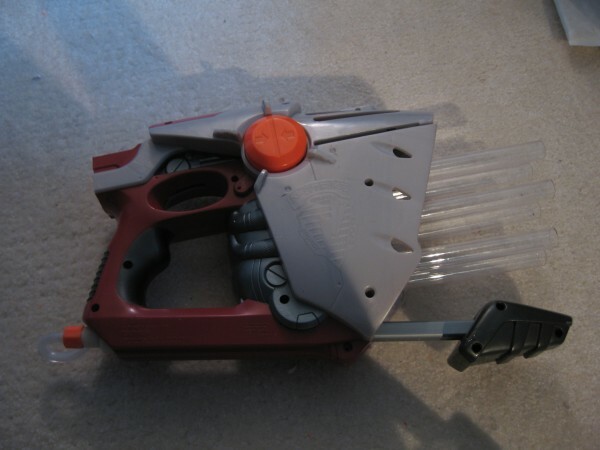 I'm already having to connect the pump to the rest of the gun using a barbed coupler. I'm going to replace that coupler with a tee and extend the tubing outside of the gun. I will be able to mount two pairs of barrels (scalped from the old gun) onto the outside of the new hornet and connect them to the tee. These reserve barrels will only be fired by the blast trigger and will give me a single massive volley shot of 4 to 10 darts. Edit: Looks as though this project will be delayed until I can get another Hornet. Edited by CaptainSlug, 28 March 2007 - 05:36 PM. That's a cool idea, but I would personally rather have 6 semi-auto shots for my type of gameplay, but that's just me. Your first hornet was cool and it's too bad it broke. Mine started to leak after a while. 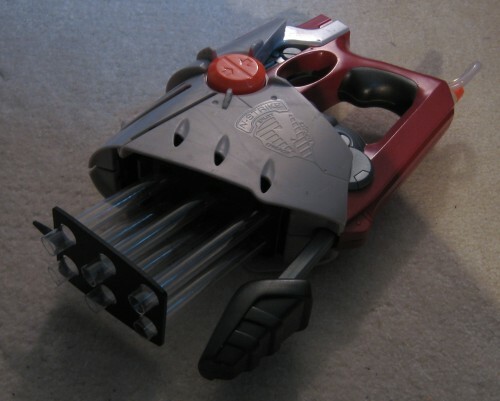 I'd like to have a hornet with some type of "clip" where all the barrels have some kind of coupler at then end and they are all attached together so you could pull them all off at once. 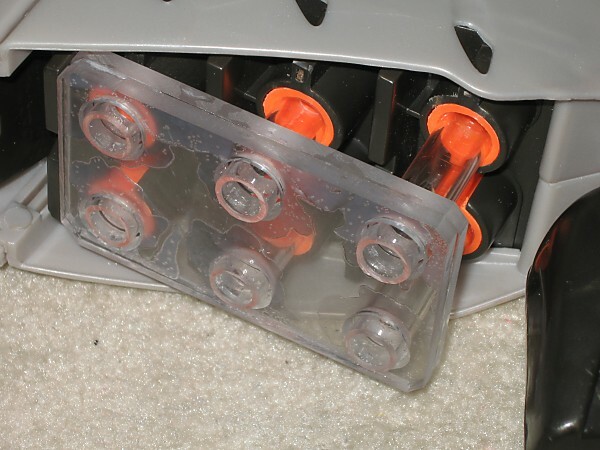 Then, you could make a couple of recharge "clips" and since you can squeeze 60 shots out of it, you'd have a monster. Looks like you could also double wield two of them. Good luck getting another one, it's hard to find working ones. Credit to Carrtoon for the mod. "The mother of invention is need... Who doesn't have to pelt people with foam?" The 6 semi-auto barrels will still work in semi-auto just fine. But the 4 extra barrels won't be tied to that valve system so they will remain unfired even after all of the 6 main barrels have been expended. And I have been thinking about trying to make a flip-around style combined clip for this gun. I'm still trying to obtain one. Edited by CaptainSlug, 30 March 2007 - 09:59 PM. Predator, stop making useless posts, you dumbfuck. Anyways, so are the external valves getting the same ranges as the internal ones? And yes, I just backseat moderated. He has been posting stuff like that a lot lately, and it pisses me off. If I need reprimanded, please do. Each barrel gets filled to the same pressure level as all of the other and will get the same ranges. Well I went out and bought an Nstrike set and I'm most of the way done modifying the gun but I've decided to put the extra barrels on my titan rather than the hornet (I couldn't find a non-awkward way to mount them). And I've decided to keep the fake stock because I kind of like the option of hooking it up to the titan, which also has a tank input on it. I have to lathe some pieces on monday and will post pics then. This gun is so damned annoying to put back together that I changed it's name to Humpty Dumpty. Edited by CaptainSlug, 06 May 2007 - 02:45 AM. I'm FINALLY FINISHED with this damn gun. Modifying a hornet is like pulling teeth while listening to muzak. But the result is still worth it. Because now it looks like this. Functions as it looks. But obvious I will be using stefans with it even though I did leave enough space in the design for stock darts to work. 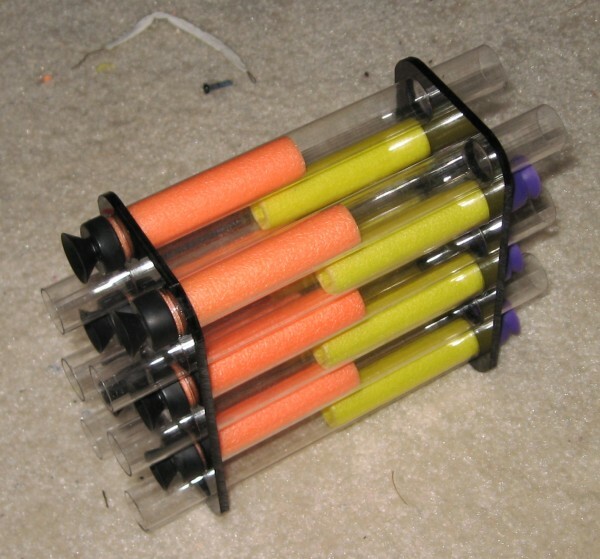 The PETG clip slides over the 1/2" OD tubes glued directly into what remains of the stock barrels. It's locked in place by the tight spacing on the 9/16" holes drilled into the first spacer plate which is solvent welded to the frame piece that has 1/2" holes. Edited by CaptainSlug, 17 May 2007 - 02:15 AM. That is really amazing. It looks like you could get off twelve shots in a few seconds, assuming the hornet works the same a a Big Salvo with more barrels, which I'm not sure of. Can it fire in semi-auto? Or only all at once? Or both? 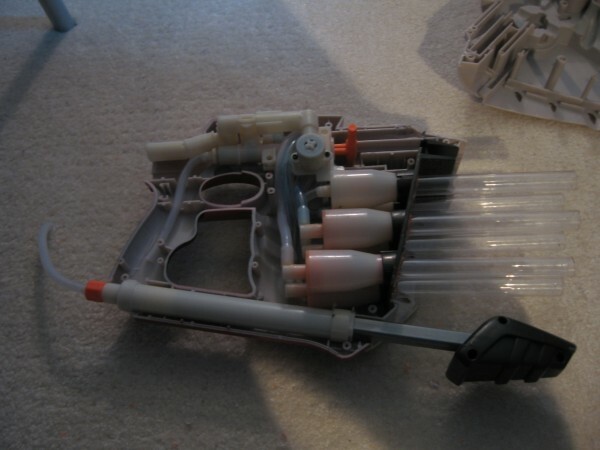 You fire 6, reset the trigger valve, flip the clip around, pump, then fire 6 more. Steller work as always. I like how you did a flip style clip for it. Now all you have to do is expand the air tank. I am assuming you have it hooked up to the unity power system though so there is no need for a bigger tank. Range level is 30-50 feet at the moment. I think the current barrels are too long. I'll make a new clip with 3" barrels and see if the performance improves. This already makes an excellent indoor weapon. Edited by CaptainSlug, 17 May 2007 - 05:07 PM. Range level is 30-40 feet at the moment. I think the current barrels are too long. I'll make a new clip with 3" barrels and see if the performance improves. I was playing with my titan, and I found my dads shotgun shells. The shottyshell shot fine but when it hit that rock it exploded. You should have shot at yourself. You would have won a Darwin Award. He already says that the barrels are too long and he will shorten them. Obviously everybody will want to increase their range--and CS is one of the best at that. Slug, that is a very intimidating Hornet. I dig the speedloader. Edited by frost vectron, 17 May 2007 - 05:03 PM. "I am a leaf on the wind--watch how I soar" - Hoban "Wash" Washburne, Serenity. I will get better ranges once I'm no longer relying on the stock pump (which at present isn't plugged) because I plan to hook this up to a high capacity tank. I only left the stock pump in place to do preliminary tests, so the range levels I'm getting now are at 15 pumps. I think that most of the range issue is the result of the clip, which I need to fine tune. I don't particularly care about ranges anyways. Anything over 30 or 40 feet is fine for me so long as it's consistent and accurate. Edited by CaptainSlug, 17 May 2007 - 06:19 PM. Really looking forward to seeing that on Saturday. Alright I'll bring it. May not get much use out of it though since it needs fine tuning.